"This strange, threadbare drama is high Holocaust kitsch... but the film gets its power and its virtue from the psychic liberation of scarred survivors living, unhealed, in plain sight and silence." Moishe Oysher plays Leo, a German concentration camp survivor suffering from traumatic amnesia. In America, Leo works as a hotel clerk next door to Luli’s Gypsy Paradise, a nightclub where he is befriended by comedian Joey Napoleon (borsht belter Joey Adams). 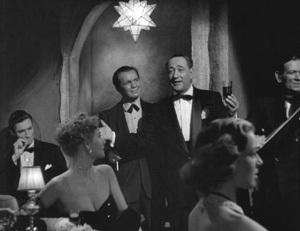 One night the two get tipsy and Leo bursts into song. “Leo the Fabulous” becomes Luli’s headliner—although he can only sing when intoxicated. Meanwhile Leo’s visits to a psychiatrist brings forth fragmented memories of his cantor father (shown in flashback with Oysher playing his father singing Hebrew cantorial music). 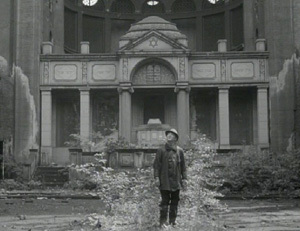 When gangsters looking for Napoleon knock Leo unconscious, his memory finally returns and Oysher is shown singing in the bombed-out ruins of Berlin’s Levetzow Synagogue, poignant scenes shot on location in 1955. This important and little known film is one of the first American features to dramatize the Holocaust and only the second to depict a holocaust survivor (called “refugee” as the film predates the use of the term “survivor”) as the main protagonist. 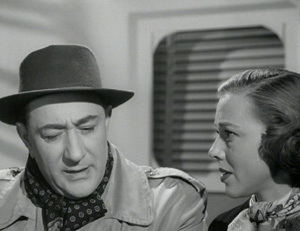 The film represents an early attempt to integrate the Holocaust into mainstream popular culture using American movie conventions of the period. 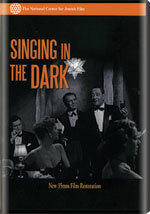 Singing in the Dark is a quirky mix of 1950s American film genres—the musical, gangster and mystery movie—and the period’s fascination with psychiatry. While Jews are not discussed directly, Jewish content is explicit, especially in the popular Yiddish songs (sung in English) and liturgical Hebrew songs. This musical drama stars Moishe Oysher as a concentration camp survivor suffering from traumatic amnesia who becomes a singing sensation. A quirky combination of 1950s movie conventions-the musical, gangster and mystery movie-this virtually unknown independent film is one of the first American features to dramatize the Holocaust. Directed by Max Nossek, Singing in the Dark stars the popular entertainer Moishe Oysher in his only English language film. Borscht belt comedian Joey Adams co-stars and produced. Academy Award-winning cinematographer Boris Kaufman (On The Waterfront) shot the film on location in New York City and in Berlin. While most of the action takes place in New York, the film includes extremely rare and poignant film material. Kaufman shot amid the remains of the Levetzow Synagogue in Berlin which was badly damaged during World War II and razed shortly after Singing in the Dark was shot. Built in 1914, the Levetzow Synagogue sat 2,000 people. On Yom Kippur 1941, the Gestapo converted the synagogue into a collection point for deportations. From there, more than 37,500 Jews living in Berlin were deported to extermination camps. Restoration was completed with funding from Linda Lipsett and Jules Bernstein and Kodak with additional support from the Wellfleet Foundation, Brandeis University, the Massachusetts Cultural Council and The National Center for Jewish Film's Reel Funders.